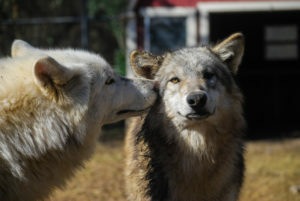 It’s Valentine’s Day and there’s nothing we love more than some fun animal love stories! From monogamous relationships to independent females that don’t need no man, Mother Nature has us covered. Many of the animals here at AWSFZ are monogamous— meaning they choose a mate and remain together for life! 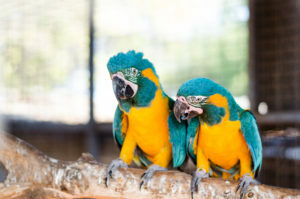 Our gray wolves, kookaburras, and our macaws are an example of nature’s call of true companionship and commitment. As we celebrate Valentine’s Day, be sure to come out and visit these furred and feathered soulmates! Did you know that many rare and endangered animals that are reproduced each year at zoos are enrolled in a type of online dating service? The goal of accredited zoos is to not only preserve species here and now, but also to ensure the survival of these animals over hundreds of years into the future. To ensure their genetic diversity, these animals are paired up according to their genetics. This produces future generations that are strong and viable and give the species the best chance at survival for generations to come. Just like any matchmaking event, some individuals don’t always mesh with their newfound partner, and some adjustments are made until we find a suitable bond. True long-term partnership isn’t about a mathematical formula, it is about that natural instinct that draws and binds us together. Nothing Wrong With Being Single! Being single isn’t a bad thing! Some animals here at AWSFZ are quite content to go it alone. 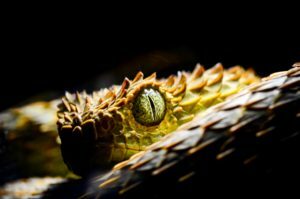 Some of the reptiles here at the zoo—such as our green anacondas and certain vipers—have been known to give birth to viable offspring without ever having a mate! Through a process known as parthenogenesis, some reptiles and amphibians are capable of producing babies without the presence of a male. This is certainly not a common event, but is nature’s way of carefully composing the rhythm of life.